Earn $1.34 in Rewards credit (134 points) What's This? 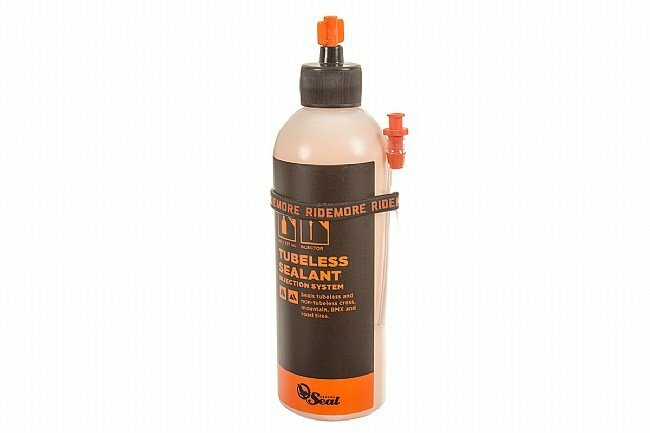 The 8oz Sealant with Injector from Orange Seal Cycling contains a combination of premium latex and what Orange Seal has dubbed "nanites". Nanites are solid particles that work with latex to fill holes up to 1/4 inch in size. This latex-nanite mixture is formulated to be as light as possible to keep rotational weight to a minimum and is made from eco-friendly ingredients. Since cycling takes place in various conditions, this sealant is designed to provide a long life span, even in extreme altitudes and temperatures. Available in 8oz bottle with injection nozzle. After reading an article in Slowtwitch.com regarding tire sealants, Orange Seal rated the best in punctures. And this was for tubes in clinchers. I run Continental GP4000sII tires (70025) with tubes. I had been experiencing a flat event about every 400 to 500 miles before using Orange Seal. On my first ride after installing Orange Seal, I had a puncture that sealed itself. I didn't notice an event until I got home and noticed the latex had been spewed out but was not stopped. I found the rock chip and removed it. It spewed for about 5 seconds and then sealed. Since then, I have had two tire cuts that the sealant would not seal. However, I have not had a puncture causing a flat since installing the sealant.